Very few people I’ve talked to thus far are clear about the very reasons why Dr. Abiy became the Prime Minister of an ancient, historically and culturally rich nation like Ethiopia. The majority of the articles, blogs, and social media commentaries that have been written about Abiy fall short of clearly showing the precursors that led him to achieve great results and huge impacts in Ethiopia and the region within a short period of time. As a person who closely studies great leaders from history and contemporary leaders around the world, I could be able to assess Dr. Abiyquickly and became one of his early supporters. 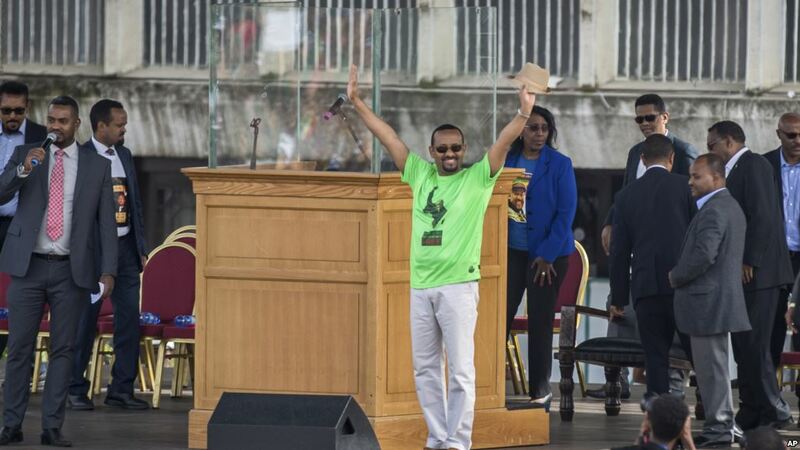 However, as time progressed, I was expecting to see lots of writings about what made Abiy special, and most importantly, what empowered him to reach this height and gain not only the admiration and respect of Ethiopians alone but also people in the region and beyond. A couple of weeks ago, while I was finalizing my latest book, it occurred to me that many people might not bother to review his life’s journey, take lessons, and practice the lessons they learned in their own life. Instead, I keep hearing many innocent people saying that what has happened in Ethiopia are the miraculous works of God. No question. God played a great role. I’m, like millions of Ethiopians, spiritual, and I thank God for what He has done from His part. Some also attribute everything to the group of people (known as Team Lemma) who played pivotal roles in the change that we are experiencing right now. Absolutely! He got continual support from his colleagues who share his vision and values. Worst, there are people who simply think that he just got lucky and found himself at the right time and place when there was an opening. I’m deeply concerned about people who think Abiy got luck or those who believe that what is happening is just as a result of miracle or mere luck. This is unproductive, to say the least. Such assessments take away responsibilities from our people. Such individuals may not step up to the plate and be part of the solution to transform the nation. They may remain spectators and fans. That was why I decided to dedicate my new book to Abiy with the hope that some may learn from his experience and follow his footsteps. I want those who may read this dedication to go beyond just adoring him. Of course, they don’t need to duplicate him. They don’t need to become a politician like him. Whatever their passion is, they can contribute their fair share in building this great nation if they dare to emulate his journey. This is a win-win to Abiy, Ethiopia, and everyone involved. To bring a lasting change in Ethiopia, we need more Abiy kinds of people with the right mindset, attitude, and personality IN EVERY SECTOR. The country cannot go anywhere better than where she has been by just having a charismatic and dynamic leader at the top. However, this requires constantly inspiring, equipping, and empowering our people to know their true self, uniqueness, passion, the unlimited potential they carry within, and how far they can go in life so that they may become part of the solution in transforming the nation. I strongly believe that the book dedicated to Abiy (similar to other books) will provide insights, stories, and approaches to help our people grow and ultimately play their unique roles in translating his vision into realities. Unfortunately, from my conversations and readings, I could be wrong; it seems that very few attributedAbiy’s dedication, willingness to learn, do his homework ahead of time, fight for his values, and take risks and proactive actions to serve the great people of Ethiopia as one of the most important factors for what we have been witnessing in the past three months. These few individuals know that he built his mindset for years and nurtured himself by reading many and diverse motivational books like this. Of course, many may read lots of books. There are bookworms. What makes Abiy different than these groups of readers is that he practiced the lessons he gained, and most importantly, learned from his mistakes. Thus, the relevant stakeholders and institutions such as universities; colleges; schools; other personal, professional, and leadership development institutions in the country and abroad should work hard to raise as many Abiy’s as possible in every sector and this book provides the roadmap. However, I’m not naïve. I suspect that many may question or, at least, hesitate to buy into my call. I understand that. Nevertheless, this is my hope that the youth (the overwhelming majority in Ethiopia) may dare to challenge themselves, be open to read the book, adapt to the mindset, attitude, and outlook shared in the book that aligns with the young and charismatic leader of the nation. I’m convinced that the youth may decide to invest their resources and time to read, and proactively practice what they learn so that we may have multitudes of Abiy’s in every sector. 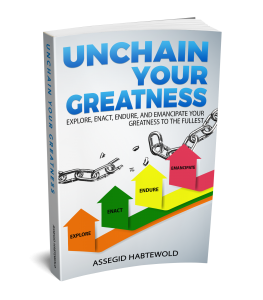 Until you get a chance to read the book, for now, let me share with you the first part of the Dedication from the new book ‘Unchain Your Greatness: Explore, Enact, Endure, and Emancipate your greatness to the fullest’. If you are like some people who stumbled on the title quickly without checking out two of my books on the theme of Greatness, let me clear the thick cloud before you read the Dedication. Without reading these books, these individuals think that I’m talking about the greatness that feeds one’s ego. They also presume that I’m promoting greatness for the sake of being great, to feel great and other selfish reasons. That is too shallow! When you read these books, you’ll understand the kind of greatness I’m promoting. If you humble yourself, set aside your wrong myths and faulty beliefs, you would join me to awaken Ethiopians back home and around the world. You would venture to walk with me side by side, first, to unchain your greatness to the fullest; second, to serve your beloved country with your uniqueness. You suppose to find the passion that uniquely qualifies you to manifest greatness during your lifetime. When you fail to do that, not only you miss a lifetime chance to get fulfilled, you’re failing to serve others GREATLY. You disappoint God and your nation, and future generations. 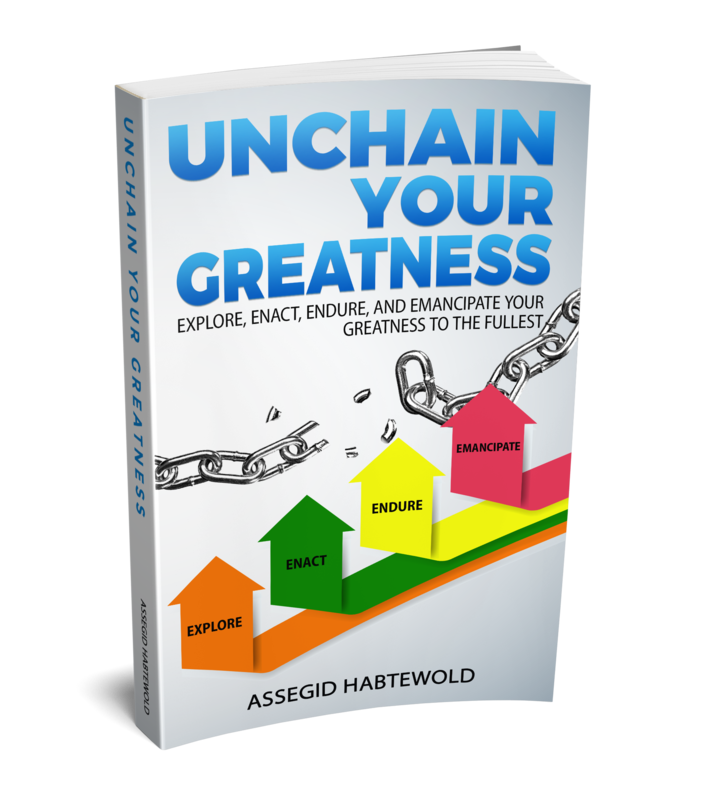 “As a result of three reasons, this book is dedicated to an emerging great one- Abiy Ahmed, who was selected to become the new Prime Minister of Ethiopia on April 2, 2018. First, since his appointment, the young charismatic leader has taken very bold actions that have inspired the whole nation. 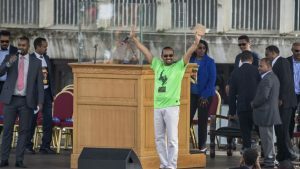 On June 23, more than four million Ethiopians took to the streets of Addis and gathered at Meskel Square to show solidarity and also admire the steps he has taken since his inauguration. I couldn’t be in Addis to join hands with my fellow Ethiopians. By dedicating this book to him, this is my small way of joining the millions back home in Ethiopia and around the world honoring the newly minted leader. To read the remainder of the Dedication, please click here.